Today is my birthday, and normally on my birthday I have scratch cake as a treat. This year I decided to do something different, and attempt to reproduce my all-time favorite dessert, something I’ve never found a replacement for. In my early teens we lived in Manitoba, and sometimes we would go down to Brandon for overnight shopping trips. 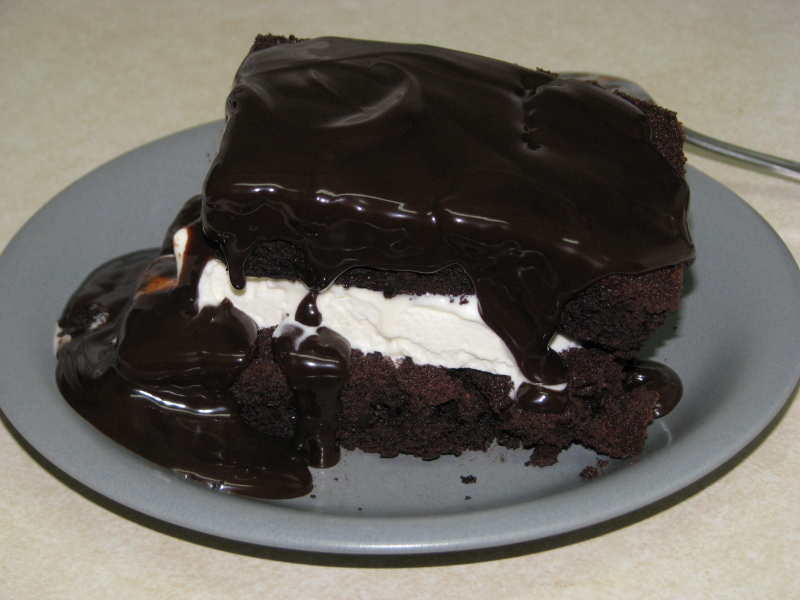 On a few occasions we ate at a restaurant called Aunt Sara’s, which had the best dessert I’ve ever had – a layer of vanilla ice cream between two warm cake layers, all covered with very thick hot fudge sauce. I had it two or three times, then we moved away. When I returned a few years later, the restaurant was under new management and no longer had the same desserts. Since then I’ve been trying similar desserts at other restaurants looking for a replacement. Injury to insult, Google tells me the restaurant has now been demolished. ABC’s Hot Fudge Mt. Baker is similar in form but not in execution – the ice cream is sub-par, the fudge sauce is runny and insufficient, the cake is too fluffy and there’s way too much whipped cream on it. Moxies’ White Chocolate Brownie is the best cake-and-ice-cream dessert I’ve found since (on the rare occasions they put enough sauce on it and remember to heat up the brownie) but it’s not the same thing. Anyway, I decided to try and recreate the original Aunt Sara’s dessert myself. I’ve been planning this for a few months and have tried several different cake recipes and fudge sauces. In the end I settled on these. Normally I’d use Haagen-Dazs ice cream, but I thought I’d try this organic ice cream I recently spotted. It’s pretty good. Although mine is a little sloppy, this actually looks pretty similar to the original (minus whipped cream, which is usually an annoyance anyway). Flavor-wise, unfortunately, it doesn’t stack up to my memories of the original. It’s close. Closer than ABC’s version and closer than anything else I’ve tried since, but still not the same. Maybe I’m over-romanticizing my memories. But it’s good and I’ll still call it a success. Going to have to finished it over several days to avoid a sugar coma tnough. Wow, the rumor of a Pong movie has been around for a long time. I still want to see the Joust movie though. Take your place among the flying elite! I cannot imagine anyone other than Hugh Jackman playing Wolverine. Especially not this guy. Sadly that FF movie actually did get made. Sadly, so did the 2005 one. I didn’t like the Lost in Space movie all that much, but I’m so glad this isn’t what got made. Sadly, the Guyver movie also got made. Poor Luke Skywalker. Evidently I need to see City Hunter. 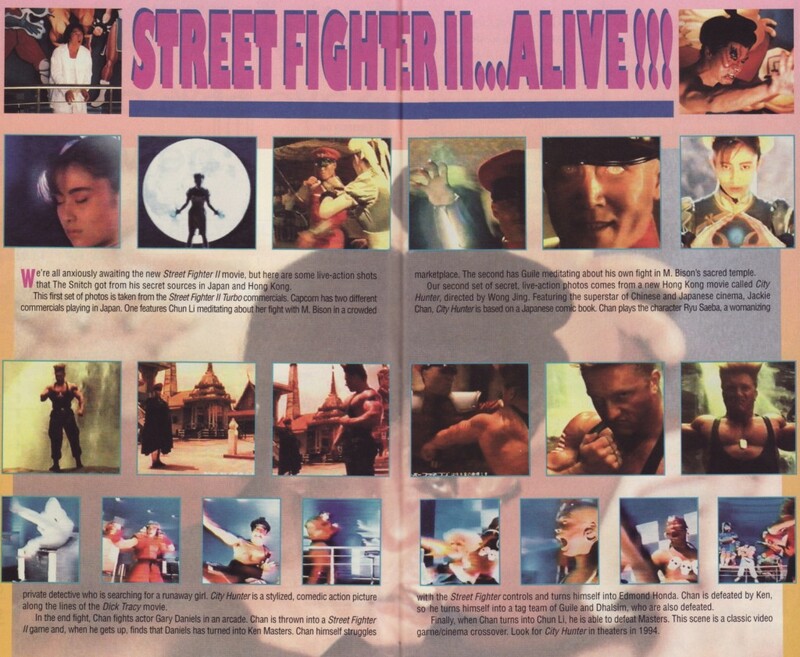 Parody aside, why is it that film and cartoon adaptations of Street Fighter are so universally bad? Oh, wait, I remember why now – it’s because the game back-story LICKS DONKEY! Great game, lousy storyline.